Why on earth would you pack a lunch for your homeschooler? You are home a lot shouldn’t you be able to just make a lunch? My answer? Kids want to eat all.the.time. I bet yours do as well. Whether or not cooking and baking are things that you enjoy about homemaking, they are a necessity. Since you are homeschooling, you are responsible for the 3 main meals each day. Not to mention the numerous snacks that kids seem to need. Do you notice when your kids are having a hard day with their schoolwork? I’m sure you do. One way that I notice is the constant distractions. My kids will need to do 100 other things before they sit down for math. Or when they sit down, they are hungry and need a snack. We have always been a family that does not limit food. If you are hungry you can have a snack. But, you don’t want to let snacks take over the rhythm of your home either! 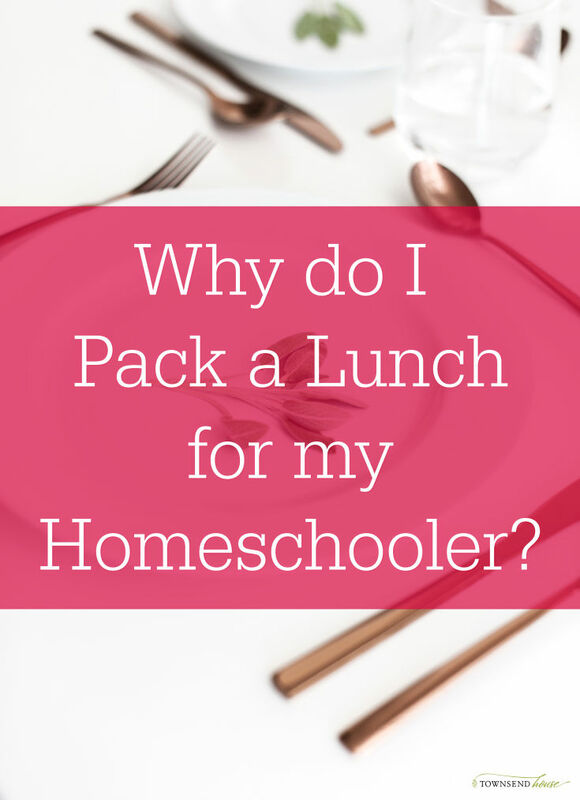 Why do you pack a lunch for your homeschooler? So that they stop asking for snacks. Also, so they stop complaining about how hungry they are. When you constantly stop teaching for a break, the work doesn’t get done. No matter how much you want to relax around your homeschoolers, there is some work that needs to be done. Not all of it will be pleasant. Taking away the “snack” question will be an enormous help. The idea came when we were back to school shopping a couple years ago. My kids love back to school shopping as much as I do. When they saw the fancy lunch boxes, their eyes grew wide. They wanted to have a lunch box as well. It dawned on me that packing them a lunch would be helpful in our daily rhythm. How do you pack a lunch for homeschooler? In the morning, or the night before, set out everything you will allow them to eat during the day. We tend to focus on the snacks portion. In the morning, they can pick up their packed lunchbox and sit at their desk for work. Or they can help pack a lunch for themselves. When they are hungry, then they can get a snack. The key component is that they are still working. We do not say when they can have the snack. If they eat all the snacks at 9am, there will be no other snacks. Giving kids the control over when and what they eat has helped immensely. They no longer have to ask for a snack, or ask to get a snack. They can just eat what is in their lunch box. It is kind of fun for the kids too, packing a lunch. This is definitely the source of a lot of stress for public school parents. I find it the opposite. When the kids are packing a lunch our days go smoother. Do you pack a lunch for your homeschooler?